Flatulent colic is the most common type of colic and symptoms are usually intermittent. The horse goes through quiet spells, followed by spells when violent pain from the pressure of gas in the bowel creates spasms that cause the horse to thrash and roll about or bite at its flank. The amount of pain is not always a good indicator of how severe the colic is. Sometimes known as wind colic, the belly becomes distended, and when striking it in front of the haunches, a hollow drum-like sound can be heard. The most common cause of flatulent colic is a sudden change in diet or improper feeding with too much new hay or grain, large quantities of green food, or food that has been contaminated. Insufficient or unclean water may also lead to digestive problems related to colic. Problems with chewing because of irregular teeth may contribute to the buildup of gas in the digestive system. In fact, anything that produces indigestion may produce flatulent colic. Good management goes a long way in preventing colic. A regular routine of feeding and exercise will keep the horse's digestive system working properly. New feed should be introduced gradually, letting the horse's system get used to the change. Hay and grain should be of good quality and not comtaminated in any way. Plenty of clean water should be available at all times. 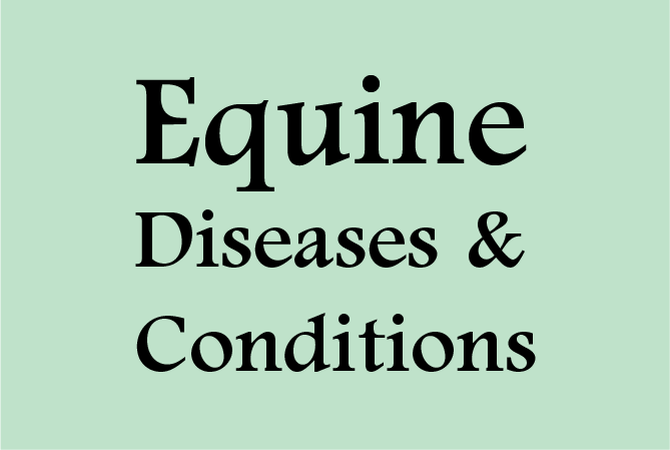 Paying attention to these routine matters of horse care will usually prevent flatulent colic. Remove all food and water and notify your veterinarian any time symptoms of indigestion or colic appear. Keep the horse as calm and comfortable as possible, allowing the animal to lie down if it appears to be resting. If the horse is rolling or behaving violently, attempt to walk the horse slowly. Follow the veterinarian's advice until he or she arrives on the scene. Usually, flatulent colic will resolve itself with passage of time as the horse moves around and the gas buildup passes through the system.